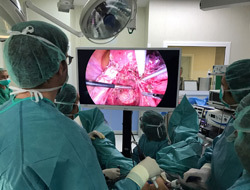 Dr. Pere Barri Soldevila, coordinator of the Surgical Section and Head of the Endometriosis Unit of Dexeus Mujer, has applied, for the first time ever in Spain, a new, less aggressive and more precise surgical technology for deep endometriosis surgery. It consists of applying a type of compressed inert gas that makes it possible to eliminate pathological tissue, minimising damage to the adjacent healthy tissue, thus reducing risks and improving the preservation of the function of the treated organs. The surgery for this type of endometriosis is one of the greatest surgical challenges in gynaecology, because in these cases digestive, urinary or even nervous system organs are often affected, and reproductive function may diminish when the ovaries are affected. However, this new technology, called PlasmaJet, makes it possible to conserve the healthy ovary much better. This is a key factor, since most of the patients affected are women under the age of 40 years. In fact, between 30% and 50% of women with endometriosis have fertility problems and this figure is increasing due to delayed childbearing. For this reason, the disease must be diagnosed as soon as possible and treatment initiated, although surgery is not always necessary. “Our Endometriosis Unit was created more than 10 years ago and we currently have more than 2000 visits a year, although we are very conservative when it comes to applying invasive treatments and only operate when strictly necessary” - explains Dr. Pere Barri.